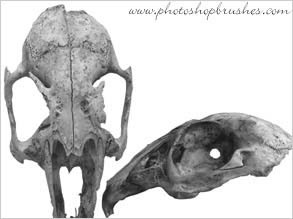 Another two Photoshop skull brushes, this set features Rabbit skulls. The original digital shots are looking down on the skull from above and a side view. I have used two different skull images for this brush set, the 'above view' must be really old as the skull has what looks like barnacles on it. Quite an interesting texture. There are loads more Skull Brushes available for free download on the Photoshop Brushes website.